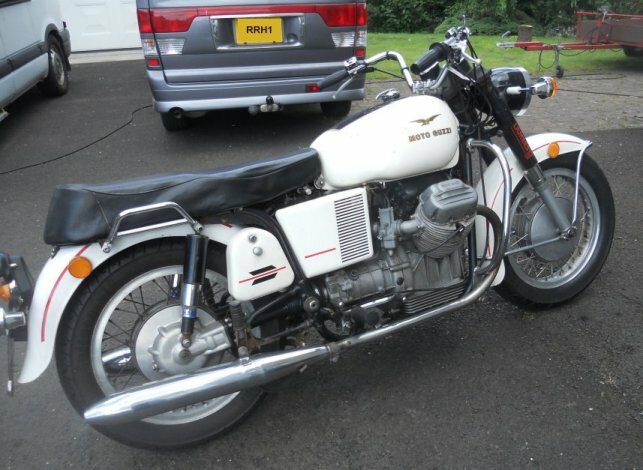 I've just got round to removing one of the heads on my 1971 V750. I assumed it would have chrome bores, but when I look inside it's dull grey, slightly magnetic and has signs of hash marks. So I'm thinking they must be Nikasil. They don't look like replacements, or if they are it was done a long time ago, because they're just as corroded as the heads. So, the question: Did any of these loop frames come out the factory with Nikasil bores? I'm pretty sure the answer is no.The factory was fitting chrome bores for several years after your bike was made.Have you looked at the cylinder by the bottom fin? does it have the word Gilardoni cast in? There may have been another manufacturer supplying Nikasil cylinders as an aftermarket item,I don't know.If it says Gilardoni it's a replacement barrel,they have been available for years.I fitted a set of Nikasil barrels to an 850T at least twenty five years ago. No. I checked for the gilardoni stamping before I did anything else. I can only assume that these barrels were replaced a lot of years ago. I had the sump oil analysed when I first bought the bike and there was no sign of excessive chromium, so, given the slight magnetism etc. I'm pretty sure they're not chrome. The bore surfaces are in pretty good condition, oil pressure is good, so the engine may have been re-conditioned ages ago, then not done much running since. Sounds good.Is she ready to ride? How about a photo ?? I have been riding, but it's presently on the ramp investigating gearbox noise - suspected bearing failure. Nice!! Keep us posted regarding the gearbox,best of luck. I think you can get a suitable engineering firm to remove the chrome bores and replace with nikasil. So maybe that what’s previously has happened to yours. Nice bike you have are your handle bars the police type, if so how do you get on with them? I’m restoring a Eldorado at the moment and I’m think of putting on the police type bars. I think they are. They're certainly a pulled back style. I've no evidence that this was ever a police bike, but I believe a lot of them went to various government organisations. I like them OK but I'm intending to get a police type screen also. The upright position is a bit wearing at higher speeds.